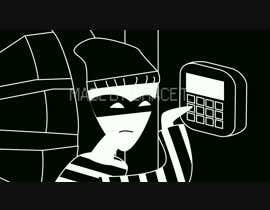 I'm looking for perhaps a black and white, sketchy animation showing a dark figure, a thief, making their way through offices. Turns out to be a bank called 'Le Bank'. Making their way through corridors, down to the vault, doging surveillance and knocking out the occasional seucirty guard, they arrive at a massive bank valt door. They skillfully crack the code to ope the door, as it opens, the contents are slowly revealed with a large well cut diamond front and center, on a stand. The camera zooms in past the thief to focus on the diamond which finishes front and center, it pauses and the words 'Diamond Vault Productions' appear on screen for a few seconds. The animation then fades to black. Total animation time to be 10-20 seconds though i'm flexible on this. hi, why you close before deadline, just yesterday I asked you to not close, you should understand that people work on it, it's not responsible to close contest before deadline! working on it, please wait ! please don't close the contest before the deadline . there is only one character. the thief. right??? Working on it Please W8. Also, yeah I thought the timing was too long. So maybe just showing the thief approaching the vault door as it opens showing the diamond. Animation a bit like the batman cartoon series. Haven't thought about background music. Hello, good afternoon, a couple of questions: Do you have a style designed for this animation? Cartoon, stylized? if you send any reference of the animation style it would be of great help since we can start working much more ahead than if we start to try to see what style you like. The other thing is music, do you have any background for this animation? that maybe will give some timming to the animation. too much stuff to happen for an intro.